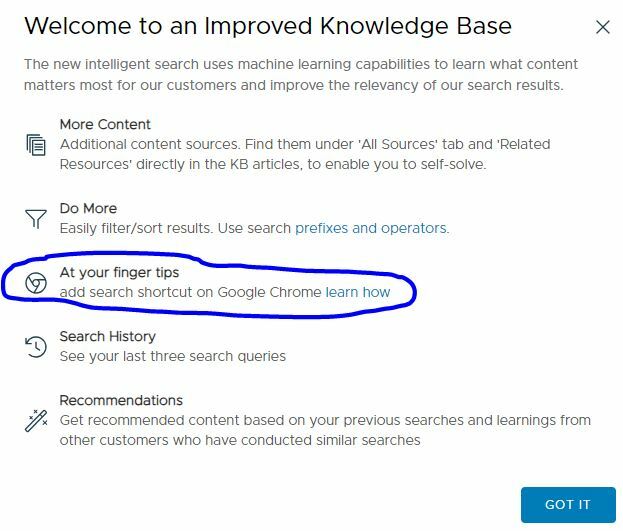 In my previous post in the VMware documentation series, I explored the VMware knowledge base site and some of the unexpected functionalities it brings if you pay close attention. I would encourage going back to read that post before continuing here as I believe it will give you a better foundation for what we’re about to do. To begin, visit the VMware Knowlegde Base site, and click on “See What’s New” next to the search button. The screen you see should be a familiar one. Those are similar enough to help us establish a pattern. Stay with me as we continue. 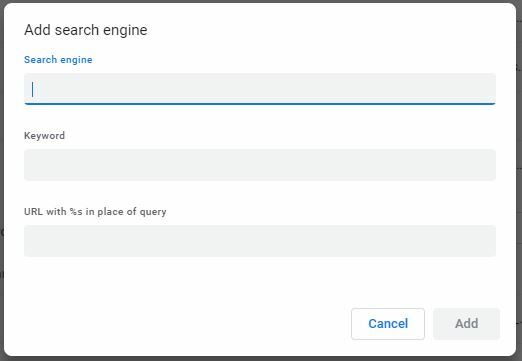 I’ll assume you read the article on how to add a search engine to Chrome and have made it to the Manage Search Engines area. Now click Add. Here’s what you will see. We’re presented with 3 fields at this point. 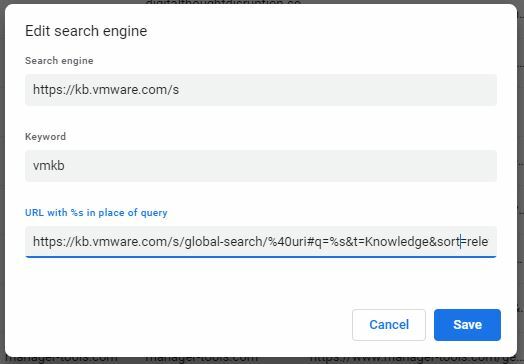 We’re going to fill them out in a very specific way so that we can use a keyword in Chrome to search the VMware Knowledge Base site for whatever term(s) we want. Use the parameters below. I am pasting them in plain text here so you can copy them and speed up the process. The keyword field can be anything you like. I chose vmkb for the purposes of this exercise. The last field was the most challenging to get right, and it’s part of the reason I showed two different examples above to reveal the pattern. Notice the placement of the %s below compared to the keywords our searches above. Remember also that %20 in the browser address bar replaces spaces in search terms. See this link for more information on that. And if you prefer a screenshot, here it is. Be sure to click Save and verify you can see the newly added search engine in the Chrome search engine list. The search engine is now ready, so let’s take it for a spin. Open up a new Chrome tab, type the keyword vmkb, and hit the space bar to see something magical. This magic trick will work for the keyword you chose previously. At this point, put in your search term(s). To ensure we got the parameters correct, let’s use vSAN disk groups as our search terms again. Press enter to perform the search, and you will be whisked away to the VMware Knowledge Base site and will notice a search was done for vSAN disk groups (just like you commanded). Our browser address bar matches exactly what we saw when the search was performed manually on the Knowledge Base site, so that means we have done things correctly to this point. What if we want to pull back results with vSAN disk groups in the title? First, make sure you read the prefixes and operators KB for some ninja tricks. Then execute the search manually from the VMware Knowledge Base site as in the screenshot below. Notice here that the operator (@title and the opening and closing quotation marks) got encoded as part of the browser address. That’s fine. When searching, it’s advantageous to use the operators and prefixes as you like without hard coding them into your custom search engine in Chrome. This begs the question…what is the best way to setup my custom search engine in Chrome to get the most value? Go back to the custom search engine we created in Chrome, and it is time to make some adjustments. Here are the parameters we will need to do a search of Docs and Blogs only. Let’s go ahead and change the keyword from vmkb to vmdoc as well. Now give it a shot. 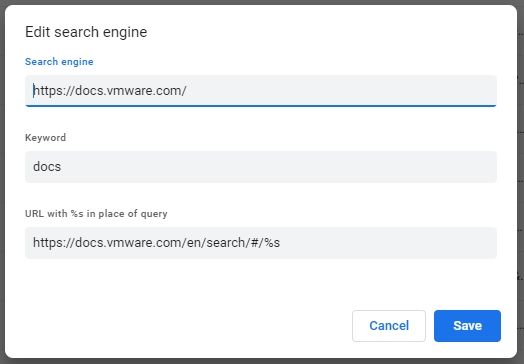 Test it by typing vmdoc in a new Chrome tab, hitting the space bar, and then typing @title=”vSAN disk groups.” Press enter to conduct your search. Does the result set match the same as a manual search of the KB site with the same search terms and results narrowed to Docs and Blogs only? They should. A Search Engine for the VMware Docs Site? No matter what filter or set of filers you choose here, there is no way to predict how the address bar will change based on your choice of filter. That means a custom search engine that will filter the results further is a no go. Wait a minute! The Docs site has an Advanced Search area. You can get to Advanced Search by clicking the icon shown here (will be on the far right side of all search boxes). There are many different ways one could choose to setup the custom search engine. You could choose to setup a few different ones. But too many will just cause confusion. That’s why I suggest one or two that will be the most helpful. And these decisions, dear reader, are up to you. Play around with the All Sources area of the VMware Knowledge Base site a little more if needed. Technically, a custom search engine could be build to filter search results by product, product version, language, or even date range. The date range does not seem to use relative references in the browser address bar even though options like today, this week, last week, this month, etc. exist in the filtering area. I could see a use case for setting a bookmark for a search that shows every blog article with vSAN in the title in the last week, for example, but I think based on what we’ve seen that is not going to work to filter by date correctly (would need to filter by date once the page loaded). I pointed out some differences in the Docs site and the Knowledge Base site in previous posts, but when it comes to the way the address bar changes upon conducting a search and filtering the results, they are very different. In any case, I think there are ways to use what I’ve written about here to do your job better and faster. And if you are reading this and are a vExpert, please sign up to have your blog promoted within VMware Blog Beat so people like me can search your content!